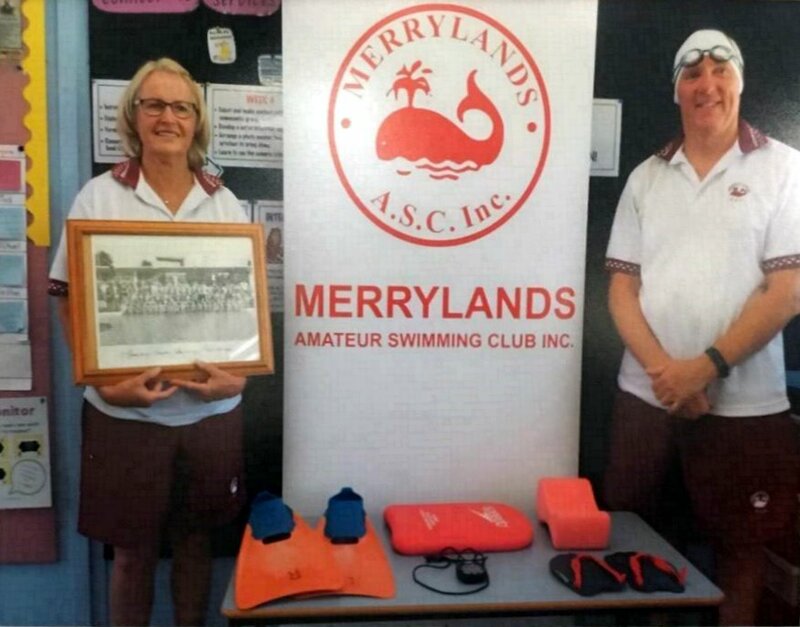 Issue 11, 2018/2019 - Whales Tales Newsletter | Merrylands A.S.C. Inc.
Alison Sakurovs is competing today at Day 2 of the Senior State Age Championships, swimming in the 50 metre Freestyle (Event 30) later this morning. There are 155 entries for this event. We wish you all the best Alison for your swim. Remember all the chocolate rewards awaiting you! The Christmas Raffle is on sale and will be drawn next Saturday 22nd December, 2018. Prizes will include gift vouchers and hampers. Please donate non-perishable items as these will help us fill the hamper prizes. Tickets are $1 and a book of 10 tickets is $10. We will also be holding a breakfast bbq, so make sure you also bring your appetite with you next Saturday. Information about the Dive In Movie is available on the club website and Facebook page. Entry to the movie is free but numbers are limited and entry into the event will be by ticket only. To find out more information or to order your tickets go to the 50th Anniversary section. Entries for the 2019 Merrylands SwimFest remain open. The program of events is available online. We are hosting the Masters BPS Sprint Meet and SwimFest on the same day, so we really need help throughout the day. Jobs on the day will include set up & pack up, timekeeping, marshalling, check starting, starting, bbq & refreshments. Please advise Graham of your availability for the day. Today sees the first block of our Learn to Swim program for this season come to a close. A very big thank you to all of our volunteer instructors, helpers & organisers who have worked with our participants over this period. We look forward to seeing more of our learn to swim participants joining in club races, why not start with the 15 metre races each Saturday. These are held at the end of club races and entries can be submitted online. The next block of Learn to Swim will run over February & March 2019. Keep an eye on the club website for information about registrations for this block. As we mentioned last week we are placing an order for a long sleeve shirt which can be used for activities at meets such as staying warm after your warm-up swim, going to the marshalling area etc. The short sleeve polo shirt remains the official club uniform item and is the shirt that is to be worn to meets and other activities when representing the club. For a short introductory period we are offering the long sleeve shirt at a club subsidised cost of $15.00 if you already own a short sleeve club polo shirt. To place an order and take advantage of the subsidised cost see the Property Officer today. This shirt cannot be ordered through the online shop. All other club uniform items can be ordered on the online shop. If you have any questions about club uniform items please see the Property Officer (Margaret Edwards). Recently our club was represented by Ian & Tricia Johnston at the Hilltop Road Public School Year 3 PBL Exhibition. This was a photographic exhibition titled Faces In our Community. Our club was selected as one of the local community groups to participate and explain how our club connects with the local community. Thank you to Ian & Tricia for giving up their time to be interviewed and to also attend the presentation of the exhibition on Monday 3rd December, 2018. 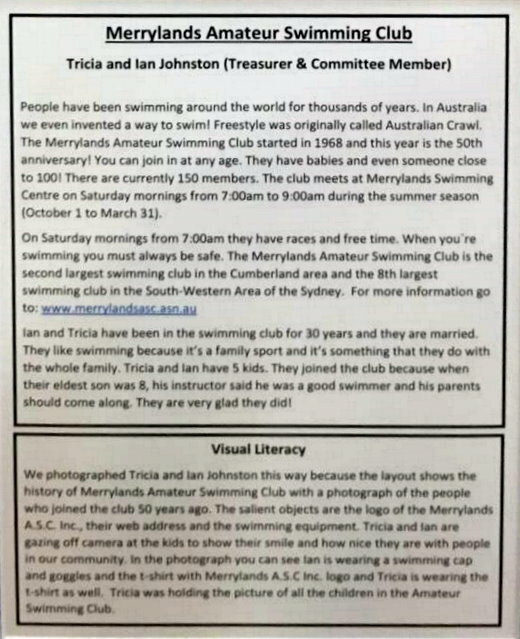 Great information about swimming and our club’s involvement in the local community. Looks like another journey the 50th Anniversary cap has made! Did you know that Michael Phelps did not swim a single best time between 2009 & 2016? An article published in the December 2018 Journal of The Australian Swimming Coaches and Teachers Association & Swim Australia provides an article on things swimmers and parents need to know about swimming plateaus. They happen to everyone. The article was written by Olivier Poirier-Leroy, a former national level swimmer for Canada. A full copy of the article can be found on the club noticeboard and makes interesting reading. Alison Sakurovs is competing today at Day 2 of the Senior State Age Championships.